Have breakfast at your hotel before departure for a day guided tour. You will have the opportunity to discover the spectacular and lively metropolis of Dubai. The city, developed from a small fishing village at the Dubai Creek, nowadays presents itself as a glamorous metropolis in the Arabian Gulf. The distinctive skyscrapers and gigantic shopping malls are sure to impress every visitor. You will start your tour with Bastakyia, the old town district of Dubai. Learn everything about the local history and geography of the city when visiting the Dubai Museum, located in the ancient fortress of Al-Fahidi. Following the museum, you will use the local water taxis, called “Abras”, to cross the Dubai Creek. Enjoy the spectacular view of the city while heading towards the district of Deira. Here you will be enchanted by the large variety of exotic spices in the famous Spice Souk. Take the chance to get a unique and affordable souvenir when you visit the adjacent Gold Souk. Your tour then proceeds to the Jumeirah area, where you will have a photo stop to capture the awe-inspiring Grand Mosque of Jumeirah. The mosque was built in medieval Fatimid tradition, the stone structure is a tribute to modern Islamic architecture. Following that, you have a photo stop at Burj Al Arab Hotel. After your tour, you can enjoy the rest of the day on your own. Afternoon Dubai desert safari is now worldwide known, Your tour departs in the afternoon, traveling across the deserts of Dubai in a 4×4 vehicle. You will enjoy several photos stops during an exciting dune drive. The drive continues across the desert where you will have the opportunity to witness a beautiful desert sunset, one of the highlights of a trip to the Arabian deserts. At the menu, dune bashing, Henna experience, sand boarding, meet the camels and in the evening enjoy a delicious BBQ dinner with entertainment. Begin your morning with breakfast at your hotel. The rest of your day at leisure. 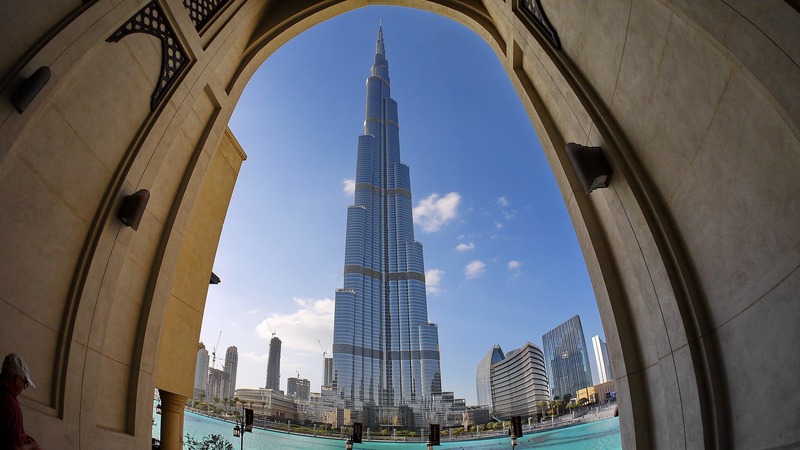 Head to Burj Khalifa on your own to climb the world’s tallest building. Entrance ticket included. Don’t forget to explore the famous Dubai Mall afterward! Breakfast. Head to Sharjah, the Pearl of the Gulf is a must to discover and complete a visit to Dubai. 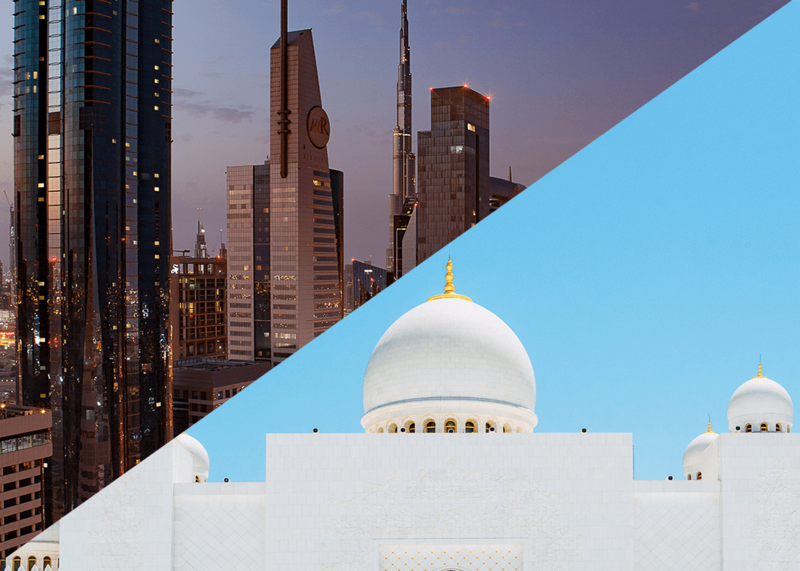 Visit King Faisal Mosque, experience Emirati culture, visit the Fort of Sharjah, and learn about the customs and traditions that are deeply rooted in the Emirati culture. Continue to the Heritage Museum, and the enchanting Souk Al Arsa and Souk al Markazi, which is a veritable treasure trove of carpets, jewelry, and intricate handicrafts. The tour ends at the Dubai Mall. Begin your day with breakfast at your hotel. Morning is leisure before proceeding to Abu Dhabi. Breakfast. Proceed to Abu Dhabi tour; we will visit the Sheikh Zayed Grand Mosque, one of the largest mosques in the world that are able to accommodate more than 30,000 worshipers. The beautiful mosque is completely clad in marble and features intricate Islamic decoration and carvings as well as extensive landscaping works. You will continue our tour towards the famous, giant Saadiyat Island project where the Louvre Museum and the Guggenheim Museum are being built to complete the image of Abu Dhabi as a cultural city. The tour will continue towards the famous Yas Island which houses the Formula 1 Yas Circuit & the first attraction park of Ferrari in the world. It quite an impressive attraction park, it is the largest covered air-conditioned park in the world with a huge red Ferrari sign as a landmark. You will return to your hotel afterward. You will arrive at Dubai airport and be met by our representative at the airport. You will be transferred to your hotel in an air-conditioned vehicle for check-in. Have breakfast at your hotel before departure for a half day guided tour. You will have the opportunity to discover the spectacular and lively metropolis of Dubai. The city, developed from a small fishing village at the Dubai Creek, nowadays presents itself as a glamorous metropolis in the Arabian Gulf. The distinctive skyscrapers and gigantic shopping-malls are sure to impress every visitor. You will start your tour with Bastakyia, the old town district of Dubai. Learn everything about the local history and geography of the city when visiting the Dubai Museum, located in the ancient fortress of Al-Fahidi. Following the museum, you will use the local water taxis, called “Abras”, to cross the Dubai Creek. Enjoy the spectacular view of the city while heading towards the district of Deira. Here you will be enchanted by the large variety of exotic spices in the famous Spice Souk. Take the chance to get a unique and affordable souvenir when you visit the adjacent Gold Souk. 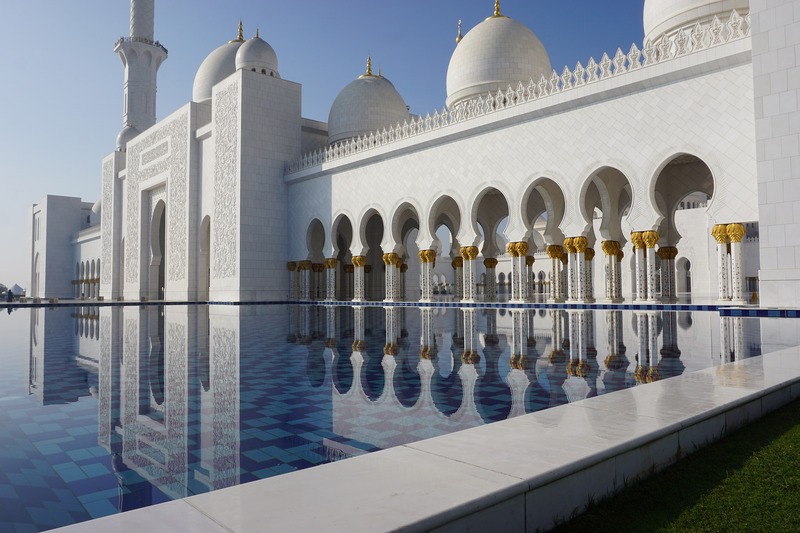 Your tour then proceeds to the Jumeirah area, where you will have a photo stop to capture the awe-inspiring Grand Mosque of Jumeirah. The mosque was built in medieval Fatimid tradition, the stone structure is a tribute to modern Islamic architecture. Following that, you will take another photo stop of Burj Al Arab Hotel. After your tour, you can enjoy the rest of the day on your own. Breakfast at your hotel. Leisure date on your own. Breakfast at your hotel. Check out is at noon. Depending on your departure time, you will be transferred to the airport. Upon arrival at Abu Dhabi, you will be transferred by our representative to your hotel. Check into your hotel and spend rest of the day at leisure. Breakfast at your hotel. Today, discover Abu Dhabi city. 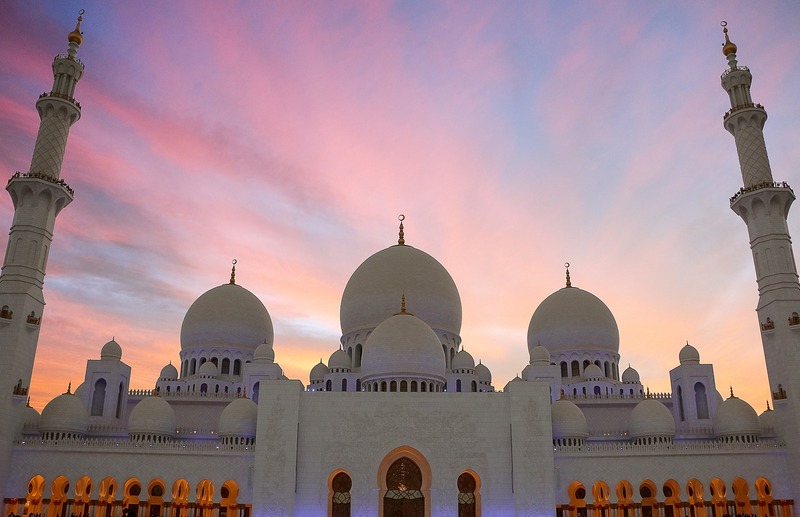 Our first stop will be at Sheikh Zayed Grand Mosque, one of the largest mosques in the world. Saadiyat Island project where the Louvre Museum and Guggenheim Museums are being built to complete the image of Abu Dhabi as a cultural city. Yas Island which houses the Formula 1 Yas Circuit & the first attraction park of Ferrari in the world. After your tour, you can enjoy the rest of the day on your own. Breakfast at your hotel. Check out at noon. Depending on your departure time, you will be transferred to the airport. Arrival transfer to the hotel. Breakfast, we proceed to discover Abu Dhabi city, Our first stop will be at Sheikh Zayed Grand Mosque, one of the largest Mosques in the world; Lunch will be served in a local restaurant. Saadiyat Island project where the Louvre Museum is open (that you will visit) and Guggenheim Museum are built to complete the image of Abu Dhabi as a cultural city. Yas Island which houses the Formula 1 Yas Circuit & the first attraction park of Ferrari in the world. Lunch is included during the tour. In the evening, we will board for a beautiful dhow cruise dinner along the Corniche. Following breakfast, discover the live city of Dubai in a city tour of four hours featuring all important site of the city namely the Old Dubai with its abras, the Gold Souk, the New Dubai with the Dubai Mall, the Burj Khalifa, the Marina, the Burj al Arab and of course the famous Palm Island. Lunch is included during the tour. We invite you for a drink to end the last hours of the year before tonight’s gala dinner. The gala dinner will be an evening to remember with a lavish buffet, unlimited soft drinks, unlimited standard alcoholic drinks, champagne, entertainment, and desserts. After dinner, we will wait for the last moment for the 2018 year, we return to Abu Dhabi. Breakfast. Morning at leisure for shopping or beach and to enjoy the first morning of 2019. Lunch at hotel and in the afternoon; we invite you for a desert safari where you will enjoy Bedouin and desert experience. View the sunset while listening to traditional Arabic music, an unforgettable experience. You will have access to dune bashing, a henna experience, sand boarding, and meeting camels. In the late evening, you will return to your hotel. Breakfast. Free time and depending on your time of flight transfer to Abu Dhabi airport for departure. We do not sell directly to consumers. If you are not a travel agent, we will pair you with a preferred agent to handle your request.